This page will have all the X2 Mount plugins I work on (or help with). These are mostly for OS X but also work on Windows, Linux (Ubuntu) and Raspberry PI. iOptron mount with V3 protocol (CEM120, CEM120EC, CEM120EC2) BETA. This plugin is meant to control iOptron mount using the new V3 protocol (CEM120, CEM120EC, CEM120EC2). The plugin is still in BETA as we're working through a few issue as user test it. The plugin has been developed and tested with a CEM120 by Eric Roubal. Both the plugin and the sources are available bellow. For the OS X package, remember to set your "Allow apps downloaded from:" settings in the "Security & Privacy" system preferences to "Mac App Store and identified developers". The Windows installer file : iOptron V3 X2 Windows Plugin version 1.0. The RPI-3 tgz file contains the needed files to install it : iOptron V3 X2 RPI-3 Plugin version 1.0. The Linux Ubuntu tgz file contains the needed files to install it : iOptron V3 X2 Linux Ubuntu Plugin version 1.0. The plugin source code is available on GitHub : Pulsar2 X2 Plugin sources. To compile the plugin yourself, you'll need the X2 Example code from Software Bisque. This is not required if you only want to install the plugin. 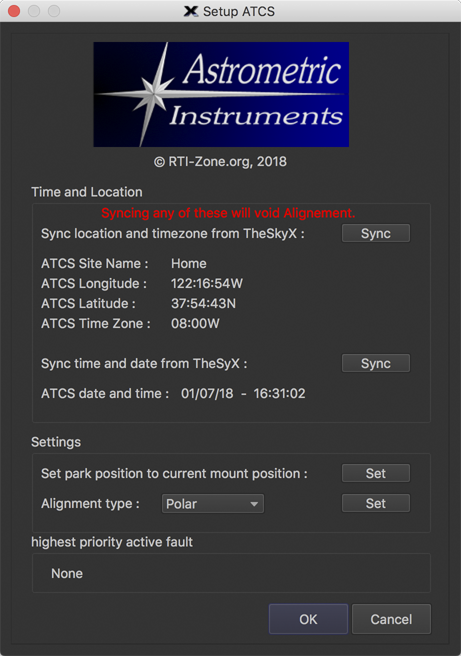 This plugin is meant to control telescope mount equipped with the ATCS controller (see the Astrometric Instruments Telescope Control Functionality). The plugin requires that the ATCS controller be properly configured using Astrometric Instruments' Maestro software. This unfortunately only runs on Windows. If the mount is not aligned you will need to make sure the date, time, location and time zone are correct. These can be synced from the settings dialog. Once this is done, you can sync to a star in TheSkyX to get the controller aligned. The Windows installer file : ATCS X2 Windows Plugin version 1.0. The RPI-3 tgz file contains the needed files to install it : ATCS X2 RPI-3 Plugin version 1.0. The Linux Ubuntu tgz file contains the needed files to install it : ATCS X2 Linux Ubuntu Plugin version 1.0. The plugin source code is available on GitHub : ATCS X2 Plugin sources. To compile the plugin yourself, you'll need the X2 Example code from Software Bisque. This is not required if you only want to install the plugin. This plugin is meant to control telescope mount equipped with the Gemini Telescope Design Pulsar2 GoTo Controller (see the Pulsar2 here). The plugin has been developed and tested with version 4.40a of the firmware. Version 5,x will be tested soon and if required fixes will be made to the plugin. The Windows installer file : Pulsar2 X2 Windows Plugin version 1.01. The RPI-3 tgz file contains the needed files to install it : Pulsar2 X2 RPI-3 Plugin version 1.01. The Linux Ubuntu tgz file contains the needed files to install it : Pulsar2 X2 Linux Ubuntu Plugin version 1.01. This plugin is meant to control a Sky-Watcher mount using an EQDIR cable (see the EQMod project). It should work for these mounts : EQ6, HEQ5, EQ5, EQ3, EQ8, and the AZEQ5 and AZEQ6 in EQ mode only. You need to install the latest FTDI drivers for your OS : http://www.ftdichip.com/Drivers/VCP.htm. 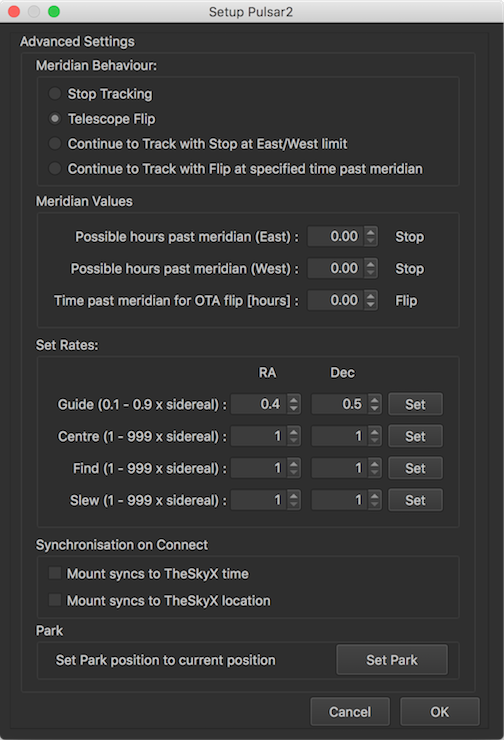 Run TSX and select your mount - you should find a category "Skywatcher EQ Mount", with one option "Skywatcher". Select this mount. Select "settings" for the mount. This will open the serial port chooser. On OS X (aka macOS), the new port will also appear in /dev/ as /dev/tty.usbserial-FTXXXXXXX, XXXXXXX being the serial number of the FTDI chip. This will never change for a given adapter, so no need to check every time. Once your serial port is selected, you can click on the "More Settings" button to bring up the mount settings dialog. 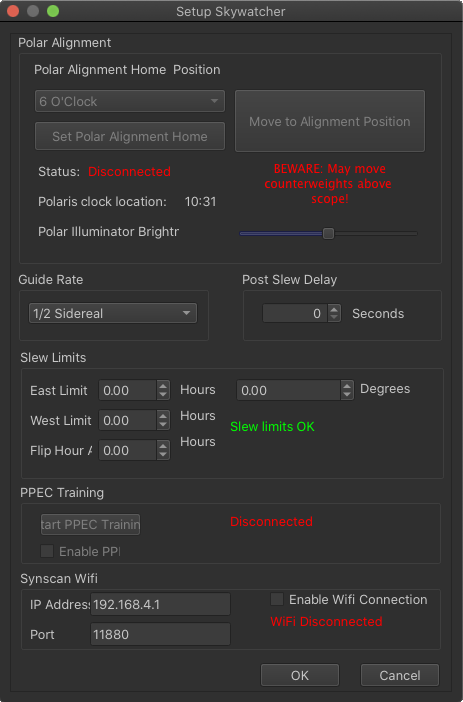 The first group of controls can be used for polar alignment - (much like the same scheme in EQMOD) - see the section later for instructions. You can set the guide rate for the ST4 port on your mount using the guide rate drop down list. You can also set an optional delay after a slew using the spin box - use this is you find that your Closed Loop Slews or Tpoint images show the scope is still moving when these are taken. Once you have set these setting to your liking, close the settings and hit Ok on the serial chooser. Then in the "Mount Setup" drop down, click on "Connect". From then on, you should be able to slew, park, set tracking rates and move and jog the mount using the controls on the telescope tab. The one big restriction at the moment is that you can't pulse guide - if you want to guide, you'll need to use a guide camera with an ST4 port. The Windows installer file : Skywatcher mount X2 Windows Plugin version 2.5. The RPI-3 tgz file contains the needed files and an INSTALL_RPI.TXT with the explanation on how to install it : Skywatcher mount X2 RPI-3 Plugin version 2.5. The Linux Ubuntu tgz file contains the needed files and an INSTALL_Ubuntu.TXT with the explanation on how to install it : Skywatcher mount X2 Linux Ubuntu Plugin version 2.5. The plugin source code is available on GitHub : Skywatcher mount X2 Plugin sources. 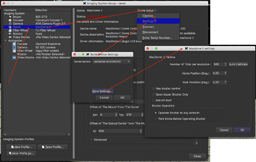 To compile the plugin yourself, you'll need the X2 Example code from Software Bisque. This is not required if you only want to install the plugin. 'TheSkyX' is a registered Trademarks of Software Bisque, Inc.